I bought these last month. I don't know why ? Maybe I will take some authentic photos with 1990's cameras. Some of the first digital cameras I had. Last edited by Intel486dx33 on 2018-11-12 @ 15:29, edited 2 times in total. Can it run Domain/OS as well or just HP-UX? I have allot of memories working with those HP 9000 computers. That one appears to be loaded with ram. Both the 6163VA and Solo 1 have PC/PCI (SBLink) headers, but no cable connecting them. All in all not bad, but not great either and exactly 0 components I was actually looking for. you guys have luck in USA, looks like in your country the retro cases were produced with materials that don´t turn yellow like a cardboard. In here all the cases were imported from china, made of cheap plastic, common designs that you always see on google photos, hence all old pcs are yellow. SETBLASTER wrote: you guys have luck in USA, looks like in your country the retro cases were produced with materials that don´t turn yellow like a cardboard. Depends on where you are. A lot of the old cases I have seen/had in the past were yellowed. Now where I am at, it is pretty much impossible to find old cases. And I really don't care for most old cases anyway unless they are aluminum. The newer cases just have so much better airflow and cable management compared to the old crappy AT/ATX cases that we used to have to use. USA? This was a thrift shop in a small town 15mins drive outside of Amsterdan, NL. Conversely some low-end stuff survives regardless - like this Highscreen case. 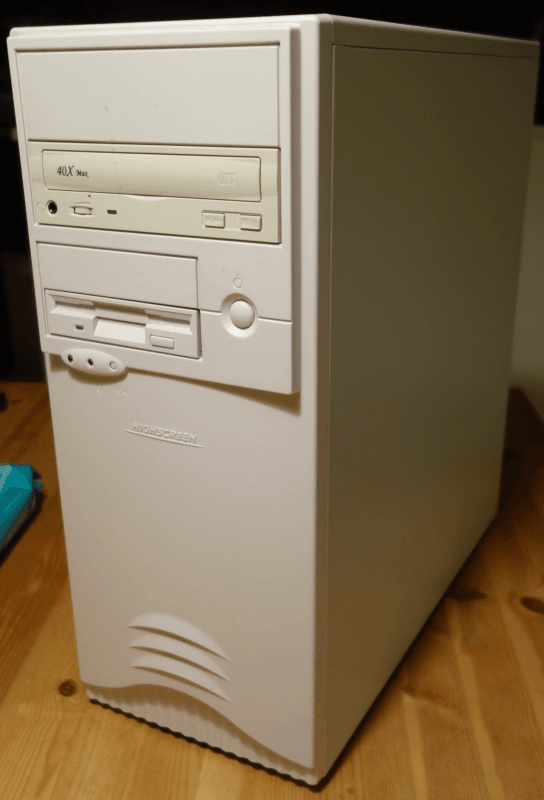 Highscreen was pretty low-end/commodity in the day, certainly nothing special (as proven by the components inside it), and definitely not designed against yellowing. Tbh though, I suspect that - given how clean and undamaged it is - this system has lived in a dark cupboard for most of the last two decades, and would rapidly yellow if you left it out in the daylight. I've seen enough other Highscreen systems turn brownish yellow. A Compaq Portable 486c, a Toshiba T3200SXC and a lot of 10 ISA network adapters, of which five are 3c509s. Finally found a cool (to me anyway) mid 2000s case, NZXT Nemesis Elite. 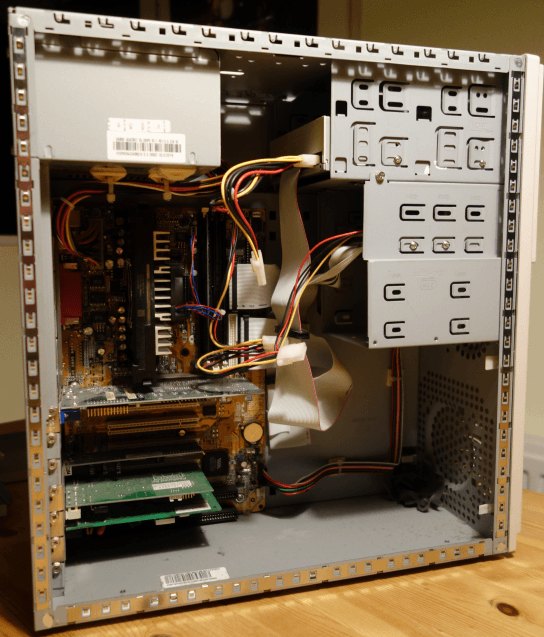 Complete system with an Asus K8N mobo and working PSU that I can use for benchmarking some stuff. A Yamaha MU5 for $25 shipped, sounds pretty good even compared to the better sound modules. Intel486dx33 wrote: I don't know why ? Nice. My first digital camera was a Kodak DC50 around 1996 or 1997. Gross by modern standards, but for the time, to be able to take pictures and have them show up on the PC was an incredible thing. These are labeled ATI Radeon but I don't know what model ? They also have silk screened "Suzuki" ? Intel486dx33 wrote: Odd ball graphics cards. According to the manual, it says it's a Radeon 7000 series card. The label on the box also clearly says "R7000"
Edit: so does the card silkscreen for that matter. One of the first cards to support DirectX 9, unlike nVidia. Time for some Socket 7 galore!